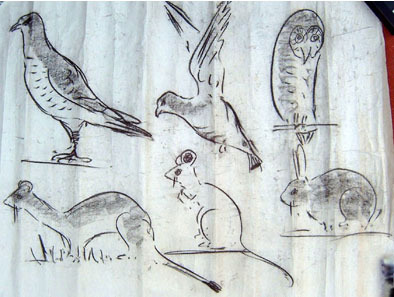 These are charcoal sketches Romany drew on 8th February 1941 during one of his lectures. 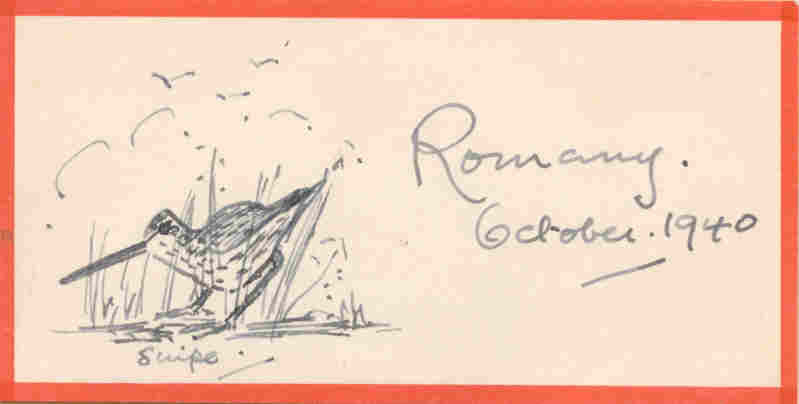 He was also very quick at sketching, illustrating the early books himself, and often doing ‘lightning’ sketches whilst giving lectures. Some examples of sketches are shown alongside this text, with one of his 1940s newspaper articles from the Yorkshire Post reproduced below. The following article is from the 1940s, written by Romany for the Yorkshire Post. It describes the Sandsend area near Whitby. The two people mentioned can still be identified – ‘Billy’ was Billy McLean, a local fisherman, and the ‘young owner’ was the Marquess of Normanby. I am writing this on the beach of a small seaside hamlet flanked by a couple of shaded streams and wooded valleys and backed by high hills. In many Yorkshire seaside places the cliffs are so high that holidaymakers find the climb exhausting after a day on the beach, but here the cliffs, being low, are of easy access and are a protection against the wind. Yesterday I walked with Raq through the wood with its tall, dignified trees and thick undergrowth. To the undertone of the sea, wood pigeons and turtle doves were cooing out sweet nothings to their mates, scores of willow warblers were singing spasmodically, and woodpeckers were chortling as they crossed from one glade to another. Right in the heart of the wood I was surprised to see a big bomb crater – the violation of a shrine to me. To Raq it was merely a pond in which to have another swim. Already Nature had been busy draping the bare, ugly crater with rosebay willow herb, ragwort and tansy, and a few mosses were appearing on its rim. It is marvellous how soon Nature turns the wrath of man to her advantage. I was interested to hear that the young owner of the estate is now a prisoner of war. It seems but a day since I saw him lying on the beach as I am doing now. I hear, too, that he is spending his time in captivity teaching Braille to blind prisoners of war. Many will bless him in future years for lightening their darkness. I have often felt that although he may actually own the hills and valleys and the rights of the beach, the real owner of the beach is Billy, a lean, tall, shabby old fisherman with a wrinkled, furrowed face. What he does not know of beach lore is not worth knowing. “What sort of a tide is it today, Billy?” I ask as we lean over the sea wall together. “It’ll not out beyond that line of rocks, I reckon,” he replies, and sure enough the tide recedes and goes no further than Billy said it would go. Another day he saw me sitting on the jetty with my sea-line and a jam-jar of mussels as bait. “You’ll not catch owt today, sir,” he said, looking at the incoming tide. Obstinately I stayed where I was. All the omens for a good catch seemed good. Billy might be wrong for once. But after a couple of hours without even a nibble I had to pack up and go home. When he feels more hopeful as to my prospects, Billy’s usual reply is: “You may get an odd un,” and the odd un usually proves to be a fish about three inches long out of the Primary Department, and as I land it I feel somehow that Billy must have given it special permission to be caught.